Hinckley in Leicestershire is overshadowed by Nuneaton, which is dwarfed by Leicester, which is crushed by Birmingham. The bigger neighbours mean that Hinckley is condemned to be small time. It has no famous people, and few would claim it is cool. But the small market town has plenty of history, and although it has long forgotten me, I, because of a friend, used to visit it often. Indeed, I remember a rejection there that convinced me that adult life would be nothing but alienation and shabby compromise. I hope that she is doing well. Romantics, bruised or not, would not be seduced or even tempted by Higgolines Herbaline Ointment. The manufacturers understood the limitations of humanity and recommended their ointment for ‘all diseases of the skin and scalp’. The cream cost 1s 3d a tin and for some people made life bearable, not just those who enjoyed the alliteration in the brand name. Hinckley has known drama and conflict. People fought over Hinckley. Three miles away in now abandoned Stretton Baskerville, Eadric the Wild led the English resistance to the Norman Conquest of 1066. Long after William, in the Civil War, the town centre witnessed battles. Control of the town alternated between the Royalists and the Parliamentarians. When the Royalists won their victory, prisoners were asked, ‘Where are the Roundheads your brethren at Leicester? Why come they not to redeem you?’ Gloating perhaps but an improvement on ‘Who are yer, who are yer?’ Democrats need not worry. The bragging rights subsequently passed to the Roundheads. In Castle Street the 19th Century Luddites used sledgehammers to smash machinery in the local factories. Industrial life calmed, and Hinckley established a hosiery industry. Today Hinckley Museum has an Atkins Frame that was missed by the Luddites and, for no apparent reason, a single 1960s stiletto shoe. The model of the Hinckley Castle in the Museum is naff but, because the original has disappeared, essential. The Big Pit Resistance Group was formed in 2014 to oppose a local wildlife haven being used as a dumping ground for rubbish and ultimately a housing development. The Group met in the Ashby Tavern and the mood was angry and the beer is okay but I have no evidence of a second meeting ever taking place. Today the town centre of Hinckley is the usual dreary retail hub of any modern British town. 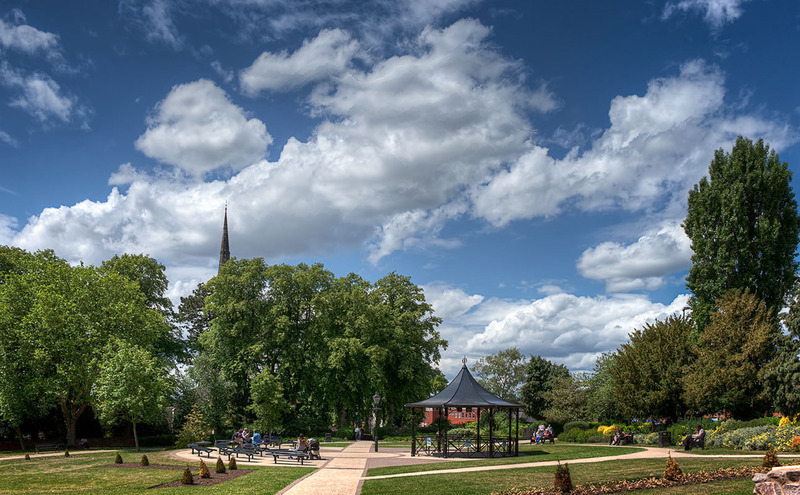 Hinckley, despite its Luddite history, has a Conservative MP, David Tredinnick. This may have been a vote for tradition but Tredinnick is an advocate of alternative medicine. The expenses claims of this rather strange ex-pupil of Eton included money for astrology software and tuition. Labour finished third in the recent General Election. Their candidate appeared to be average and normal. Tradition is evident in Hinckley because Hinckley Market is 700 years old. The Market has a good reputation although the goods on sale are the usual mix. Owning a market stall must be a risky business. Stall owners are required to have £5,000,000 public liability insurance and £10,000,000 employee insurance. But you cannot keep a good entrepreneur down and Castle Street has a fine Art Gallery, which includes a Cafe and Studio. The latter provides ten workshops each year. Posted in Uncategorized on June 21, 2015 by Howard Jackson.